Roomy and refined dome top roofline with extra space for hanging toys and letting your bird stretch its wings. Expertly engineered in the US to be easily assembled and with terrific bird friendly features. 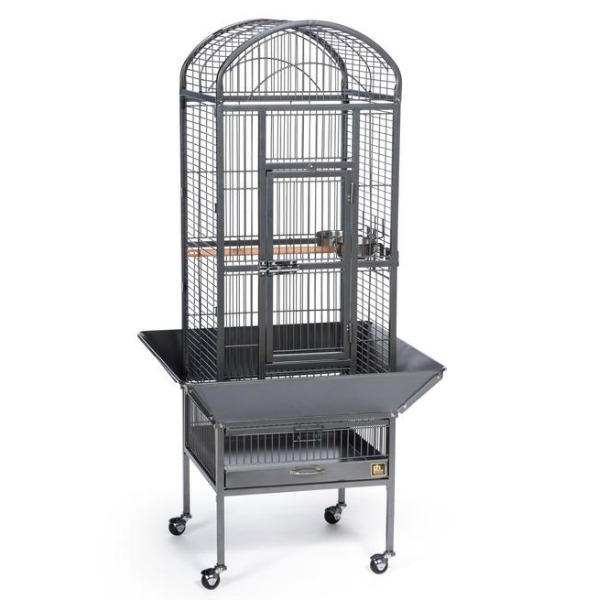 This wrought iron constructed cage offers quality craftsmanship. Rounded corner seed guards help control mess outside of the cage and are less likely to damage walls or catch on your clothing. Both grille and debris tray are removable for ease of cleaning and the integrated cage stand sits on sturdy, easy rolling casters. Dishes lock into place within the 6’’ long by 4 3/8’’ high cup doors. Finished with a durable and elegant black hammertone powder coating, Prevue cages undergo independent lab testing and conform to the highest levels of pet safety.